New Arsenal head coach Unai Emery has revealed how he plans to get the best out of Mesut Ozil’s form next season. Ozil endured an indifferent season last term and at times showed glimpses of his mercurial talent, however, his form began to dip after signing a new contract in January and towards the end of the campaign. 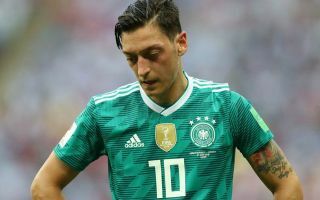 It was later revealed that Ozil missed the last few games of the league season due to a back injury, but he came back to take part in Germany’s disastrous World Cup 2018 campaign. The current World Cup holders suffered a humiliating exit from the group stages for the first time since 1938 – a remarkable 80 years. Ozil was also targeted by certain quarters in his homeland for appearing in a picture with controversial Turkish president Recep Tayyip Erdogan. One of Emery’s key tasks will be to get the best of the Gunners’ talisman and the Spaniard has revealed how he will ‘fix’ Ozil’s form whilst highlighting his important to the team. “We are here to help every player,” Emery said, as reported by Sky Sports. “For me it’s the same for one player as it is for 25 players, to help them. For us Mesut is a very important player.